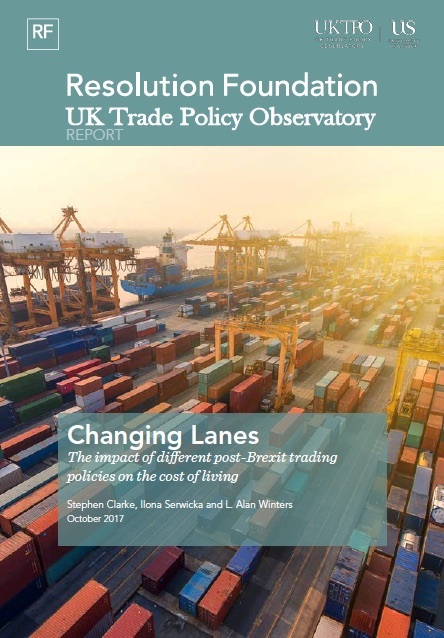 Changing Lanes examines the impact two “no deal” Brexit scenarios – reverting to WTO ‘most-favoured nation’ (MFN) or unilaterally reducing all tariffs to zero – on prices and living standards. The report finds that the average annual household spend would rise by £260, and that over three million families would experience price rises of over £500 a year. In addition, the research shows that poorer households would be most affected by a ‘no-deal’ scenario in which tariffs and prices rose. This paper assesses the possible consequences of the Government’s proposed No Deal tariff regime. While there have been numerous previous assessments of the economic impact of a ‘No Deal’, the tariff proposal by the UK Government provides a new set of tariffs which have not been assessed in the existing empirical literature. 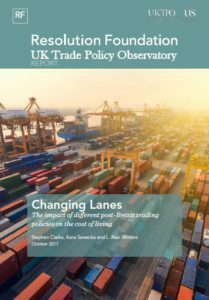 In this briefing paper, the authors explain carefully the Government’s proposals and identify how much of UK trade would be affected by the changes in tariffs in a ‘No Deal’ scenario and provide an empirical assessment of the scale of the economic challenge which could face UK industries in the event of ‘No Deal’. They find that a ‘No Deal’ Brexit will pose a significant challenge to the UK economy with a negative impact on output, exports and imports driven largely by the increased cost of trading with the EU. The results highlight that in the event of ‘No Deal’ the Government’s room for policy manoeuvre is somewhat limited. WHAT IS THE EXTRA MILEAGE IN THE REINTRODUCTION OF 'FREE ZONES' IN THE UK? Since the EU referendum, there has been a growing interest in the reintroduction of free zones in the United Kingdom. Those advocating free zones believe that they will help to boost British trade after Brexit and promote economic growth. This briefing paper presents a history of free zones in the UK and US and then looks at the EU context. Although there are potential benefits and savings that businesses can accrue from simplified customs procedures and relief on customs duties and tariff inversion, the authors explain that such benefits will be very limited in the UK context. This is due to state aid rules which limit the scale of assistance possible. The UK would still be affected by these in some way post-Brexit. Thus, while there is a scope for free zones shaping an export-oriented place-based regional development programme, policymakers should devise measures that counteract possible diversion of economic activity from elsewhere, and offer a wider set of incentives than just free zones, while keeping within our WTO and any ‘level playing field’ obligations that arise from our trade agreements. Read Briefing Paper 28 – What is the extra mileage in the reintroduction of ‘free zones’ in the UK? This study focuses on the economic shocks that a ‘no deal’ Brexit would entail across the constituencies of Hampshire and Sussex. We take estimates of the effects of a ‘no deal’ Brexit on output and employment in different sectors of the UK economy and using the composition of employment in each constituency, estimate how each constituency will be affected. The novel feature of our analysis is that we allow for commuting and so convert the Brexit shock from referring to workers in a constituency to referring to residents in the constituency. With the South East region the most heavily engaged in cross-border trade, after allowing for the fact that people often live and work in different places, we estimate that the shock to residents of Hampshire and Sussex could be equivalent to the loss of about 43,000 jobs. Given that Brexit decisions will ultimately be taken on the floor of the House of Commons, this Briefing Paper provides a base from which Hampshire and Sussex MPs can start to assess the impact of Brexit on their constituents. This Briefing Paper provides a comprehensive overview of the EU’s Most Favoured Nation (MFN) clauses on services and investment. It discusses their scope and the exceptions they contain, and then considers how these clauses are likely to limit the extent of concessions that the EU and its existing partners are prepared to grant the UK. The UK government has high expectations about future services trade deals with non-EU countries. Yet, in practice, Free Trade Agreements (FTAs) typically only provide greater legal certainty about current applied policies rather than bringing about actual trade liberalization in services.This Briefing Paper looks at why it is so difficult to achieve actual liberalization in service negotiations and what FTAs, in practice, can offer. The authors argue that based on other countries’ experiences, the UK government will face several significant challenges and complexities in negotiating services FTAs with non-EU countries. To make progress on FTAs, the UK government will need to encourage many bodies across government. In this Briefing Paper, we provide an analysis of inward FDI to the UK before and after the EU referendum, looking at the main foreign investors, which sectors they invest in and how trends in inward FDI have evolved over time. Our work suggests that following the Brexit vote, inward investment has been 16-20 per cent lower than it would have been if the UK had voted to remain a member of the EU, but that this impact differs depending on the sector. The UK is one of the most services-oriented economies in the world, both in terms of production and exports. Services inputs embodied in manufacturing exports constitute an important but under-appreciated kind of services exports, so-called mode 5 services trade. This Briefing Paper provides the first estimates of mode 5 services trade disaggregated by UK region and industry, respectively, and over time. UK manufacturing exports entailed over £70 billion worth of domestic services inputs in 2017, which play an integral role in the competitiveness of UK manufacturing exports. Since these services are produced locally, changes in the trading environment for manufactures have direct implications for domestic employment in services sectors. Leaving the EU will involve some possible combination of changes in tariffs, non-tariff measures, and also the amount of fish quotas that can be caught by the UK and the EU. The aim of the Briefing Paper is to detail the policy environment, and the policy considerations facing the UK government in the Brexit negotiations. Secondly, it provides an empirical assessment of what the impact on leaving the EU might be on the seafood industry. As the nature of the UK’s future trade relations with the EU are still uncertain, this paper explores several simulations which aim, broadly speaking, to capture the key variants of Brexit that appear to be under discussion. THE FUTURE OF US-UK TRADE: WHAT CASE FOR A BILATERAL TRADE AGREEMENT? July 2018 – Authors: Marc Busch, Michael Gasiorek, Peter Holmes, J. Brad Jenson, Rod Ludema, Emily Lydgate, Anna Maria Mayda, Pietra Rivoli, Jim Rollo, Stephen Weymouth, Rorden Wilkinson and L. Alan Winters. Both US President Donald Trump and UK Prime Minister Theresa May have stated their keenness to negotiate and agree the groundwork for a bilateral trade agreement after Brexit. This briefing paper looks at what the key issues are likely to be and what a transatlantic agreement may, or may not, comprise. First, we explore the extent to which a trade agreement between the US and the UK would have popular support at a time when debate about trade on both sides of the Atlantic is contested. Second, we consider what the benefits of such an agreement might be by considering the aggregate economic case. Finally, we probe where problems and tensions may lie, focusing primarily on the regulatory aspects of a transatlantic commercial tie-up. Read Briefing Paper 20 – The Future of US-UK Trade: What case for a bilateral trade agreement? As the UK contemplates new trade agreements, it needs to develop mechanisms to ensure that these uphold its commitment to environmental protection and high labour standards. This paper examines approaches to integrating sustainable development objectives into the negotiating process and reflecting these objectives through trade agreements. The UK’s ability to take leadership in this area will hinge on its ability to develop a robust framework to ensure that the negotiation process is transparent and allows for public consultation, and that the impact of new trade agreements – including on the environment and vulnerable populations – are assessed and addressed. In this respect, the UK can draw from, and improve upon, the EU’s experience with Sustainability Impact Assessment. The paper also highlights implications of the UK’s inheritance of the EU’s ‘cooperative approach’ to trade and sustainable development through the continuation of its trade agreements. In the search for a framework for a future UK-EU trade relationship, the Comprehensive Economic and Trade Agreement between the EU and Canada (CETA) has come under the spotlight. To inform the debate surrounding a potential ‘Canada plus’ model for the UK post-Brexit, this briefing paper provides an overview of the extent to which the EU restricts imports of services from Canada under CETA. The authors identify areas where ‘pluses’ may help to preserve existing levels of services trade between the UK and the EU post-Brexit, and discusses whether these are achievable. Further, the extent to which the EU’s commitments in CETA improve on pre-existing regimes is evaluated by comparing the degree of liberalisation in CETA with the EU’s prior commitments in the GATS. Read Briefing Paper 18 – Can CETA-plus solve the UK’s services problem? There is much discussion about what the UK government wants in terms of the post-transition relations between the UK and the EU, and the Labour party has now also provided a little bit more clarity on its position. However, to what extent are the different UK-EU Brexit options achievable? Dr Michael Gasiorek explores two key concerns. The first concerns the issue of the compatibility or not of the different UK-EU Brexit options, with the issue of the border between the Republic of Ireland and Northern Ireland. The second issue concerns the subtleties of the difference between being in “the” EU Customs Union, in comparison to being in “a” customs union with the EU. While it might appear a small difference, in practices the differences may be substantial.The aim of this briefing paper is to consider what difference these developments make, to examine under what circumstances might the UK governments current position on future arrangements with the EU be possible (or not), and to offer some recommendations and reflections for the way forward. Trade in manufactures constitutes 65% of the UK’s trade with the EU and nearly 50% of the UK’s exports of manufactures go to the EU. In this new Briefing Paper, we look at the possible effects of Brexit on UK manufacturing in much greater sectoral detail than has been done before. For 122 manufacturing sectors, we estimate the exposure of these sectors to different versions of Brexit. Our projections depend on whether we assume the UK leaves the Customs Union and the Single Market, and on whether the UK makes a free trade agreement with the EU and is able to carry over existing free trade agreements with non-EU countries. In all cases, we find that introducing tariff and non-tariff barriers raises the prices that UK consumers and producers will face, and leads to reduced UK exports; but for some sectors, the increase in protection leads to higher UK output. The impact of Brexit is likely to be significantly different between high-tech and lower-tech sectors. Read Briefing Paper 16: Which Manufacturing Sectors Are Most Vulnerable to Brexit? Rules of Origin (RoOs) are used by importing Customs authorities in the international trading system to determine if a product is considered as sufficiently linked to the exporting country to count as originating there, in order apply preferential or MFN (Most Favoured Nation) rates of tariff to the goods, and to check for quota, anti-dumping and related compliance. The importance of RoOs is due to the fact that duties and restrictions in many cases depend upon the source of imports. Proving origin will be a far bigger issue than it is now for UK business exporting to the EU after Brexit. With all businesses likely to have to rethink their compliance with Rules of Origin post-Brexit, this paper, based on a study carried out with the support of the British Chambers of Commerce, outlines the current Certificates of Origin regime and the options for change after Brexit. The UK’s exit from the European Union (EU) is likely to have significant ramifications for services trade because the Single Market has been particularly salient for facilitating the international exchange of services. Yet the discussion of potential effects on the British economy of Brexit has largely been confined to manufacturing sectors at the national level. Less attention has been paid to services sectors, even though the UK economy is particularly strong in exporting services. To address this void, this Briefing Paper describes the rich pattern by which UK regions are exporting different kinds of services. In particular, it traces the extent to which UK regions export services relatively intensively to EU countries relative to other destinations outside the EU. Read Briefing Paper 14 – BREXIT AND REGIONAL SERVICES EXPORTS: A HEATMAP APPROACH and the Online Appendix. Rolling over the 37 Free Trade Agreements (FTAs) with more than 60 countries that the UK currently has through the EU will be a monumentally complicated task and one that needs to be completed by March 2019. This Briefing Paper outlines why it may not be easy to get agreement on grandfathering with the FTA partner countries, and why even if agreement could be reached it is unlikely that trade will continue on the same basis as previously. A key point which emerges is that with regard to several key issues – Rules of Origin (RoOs), Most Favoured Nation (MFN) clauses, mutual recognition, and tariff-rate quotas – grandfathering the agreements is unlikely to happen without some engagement or negotiation with the EU. Hence what you might think is a bilateral issue between the UK and a given FTA partner, becomes a trilateral issue which also involves the EU. Consumers face many challenges post-Brexit. The new UK Trade White Paper published by the Department for International Trade in October 2017 has stated that it will give a major priority to consumers, but details remain to be spelled out. Increasing scepticism about free trade puts at risk the classic gains from trade – lower prices and better choice – and gives rise to fears of job losses from increased imports. On the other hand, some fear that Brexit – and potential trade agreements with third countries – will weaken or undermine consumer protection. In the addition to these substantive issues there are procedural questions too – how is consumer interest represented? This briefing paper addresses these issues of trade policy and consumer interests. A UK BREXIT TRANSITION: TO THE UKRAINE MODEL? The UK is searching for a framework for its post-Brexit trade arrangements with the EU. A clean Brexit from the EU has always been unrealistic and the EU is limited in the kind of trade arrangements it offers to third countries. This briefing paper examines the EU-Ukraine Association Agreement (AA) suggesting how a similar agreement may offer a way forward for the UK-EU negotiations. The EU-Ukraine AA reveals that the EU is willing to adapt previous Agreements to new circumstances. A similar UK-EU Agreement could provide access to the Single Market, maintain inward investment incentives and provide an attractive location for establishment of firms and enterprises, especially in the services sector – an area the UK is keen to protect. For the UK, the adoption of this approach would require less unravelling of existing UK laws, but offer some room for independence in negotiating future issues. Read Briefing Paper 11 – A UK BREXIT TRANSITION: TO THE UKRAINE MODEL? The EU Customs Union and Single Market created a significant volume of trade between the UK and the EU and stimulated the development of European value chains.The UK government has stated its intention to leave the Single Market and Customs Union and this remains the position of the leadership of both main political parties. Yet both enable a degree of integration far exceeding that attainable through any simple tariff-free Free Trade Area (FTA). In this briefing paper we examine the possibilities for maintaining some of these benefits in key sectors. WTO rules are drafted and applied in such a way that the UK and the EU27 could design a WTO-consistent trade agreement that goes some way towards preserving current trading conditions in a subset of sectors. We discuss how this might be achieved and also some of the limitations that such an approach entails. Read Briefing Paper 10 – AN A UK-EU FREE TRADE AREA PRESERVE THE BENEFITS OF THE SINGLE MARKET AND THE CUSTOMS UNION IN SOME SECTORS? The UK has accounted for a major share of the world’s wine imports for centuries, and wine currently accounts for more than one-third of UK alcohol consumption. Its withdrawal from the European Union (Brexit) therefore will affect not only UK wine consumers, producers, traders, distributors and retailers but also suppliers of those imports. Based on a model of the world’s wine markets, the impacts of various alternative Brexit scenarios are determined through to 2025, involving adjustments to UK and EU27 bilateral tariffs on wine imports and any changes to UK income growth and the value of the pound over the period of adjustment. The research finds that in the main scenario considered, for consumers in the UK the price of wine in 2025 is 22% higher in local currency terms than it would be without Brexit, the volume of UK wine consumption is 28% lower, and the value of UK imports is 27% lower because of Brexit. Such a sales reduction in the UK would be a blow to participants in UK wine bottling, transporting, storing, wholesaling and retailing businesses, as well as restaurants and pubs. Read Briefing Paper 9 – WILL BREXIT HARM UK AND GLOBAL WINE MARKETS? This briefing paper looks at some of the legal issues that will affect the UK’s public procurement laws and policies following Brexit. When the UK leaves the EU, it is unlikely to be able to simply rollover its current procurement coverage under the WTO Government Procurement Agreement. However, this opens up the possibility of pursuing horizontal policy objectives, such as promoting SME or green public procurement, which is possible under the WTO GPA obligations, but will also need to comply with other multilateral rules. Brexit could offer the UK the possibility to craft a procurement system flexible enough to incorporate the devolved procurement legislation, under the supervision of the Competition and Markets Authority. Such an integrated approach would be beneficial for value for money, legal clarity, and enforcement. It would help to ensure conformity to WTO commitments, while acting as a counterweight against fragmentation. EU policies have directly influenced UK food supplies and prices, the profitability of farm businesses, and the rural environment and land use. While Brexit offers the UK an opportunity to design a more efficient agricultural policy that would benefit farmers and the environment, this new policy could have possible implications for consumer prices and will have to conform to World Trade Organization (WTO) rules. This Briefing Paper explores the issues around existing and continuing support for farm businesses and the rural environment, and the UK’s future agri-food trade relations. Trade in services is economically significant for several reasons; it directly affects UK consumers’ welfare in such sectors as telecommunications, health or retail distribution; producer services such as finance, transportation or professional services are inputs into both the production and international exchange of goods; and it makes a positive contribution to the UK’s current account. Brexit will have important repercussions for the UK’s economic ties with the EU in the realm of services markets. This paper highlights how Brexit might directly and indirectly affect UK services trade and policy-making in this area. Read Briefing Paper 6 – SERVICES TRADE IN THE UK: WHAT IS AT STAKE? UK-EU TRADE RELATIONS POST BREXIT: TOO MANY RED LINES? This briefing paper provides an evaluation of the feasibility of different options for post-Brexit trade relations. With the EU accounting for close to 50% of the UK’s imports and exports of goods and services, the focus in this paper is on the UK’s future trading relations with the EU itself. Whilst all of the options listed in this paper are problematic, the aim is to examine the limitations of what may be feasible and – in so doing – to suggest a way, or ways, forward. Given that the UK’s objectives take the form of seeking to impose certain constraints on the post-Brexit outcome, we look at the extent to which each option is consistent with these ‘red lines’. Read Briefing Paper 5 – UK-EU TRADE RELATIONS POST BREXIT: TOO MANY RED LINES? Article 50 of the Treaty on European Union (TEU) will govern the UK’s withdrawal from the EU. Several aspects of the interpretation and application of Article 50 TEU pose particular challenges, including domestic controversy regarding the constitutional requirements for triggering Article 50 TEU, the short time-span of negotiation, and the uncertain role for the UK in trade negotiations with the EU and the rest of the world during the withdrawal process. This paper outlines these issues, focusing in particular on the EU and international trade dimensions of withdrawal, in order to provide clarity and highlight potential pitfalls affecting both the EU and the UK. This briefing paper summarises two issues that a post-Brexit United Kingdom would face if it re-joined the European Economic Area (EEA). It introduces the concept of the EEA+EU as a ‘regulatory union’ within which products, once approved in one country, can circulate freely. Secondly, Rules of Origin (RoOs) — which in effect specify the domestic share of value-added — would need to be adhered to, raising concerns about the viability of supply chains with UK links. This paper discusses the challenges for the UK as it attempts to redefine and renegotiate its post-Brexit foreign trading relationships. This briefing makes the assumption that the UK will not, after leaving the EU, remain part of the customs union. On this basis, the paper examines the nature of such trade negotiations; the scale of the negotiating tasks confronting the UK; and potential approaches that may reduce the immediate negotiating load. It also identifies the countries that should be prioritized for trading negotiations, and examines the likely resources that will be required to undertake these. By electing to leave the European Union, the United Kingdom has chosen – among many other things – to leave the customs union (and the single market that includes all member states) and reassert its status as an individual member of the World Trade Organisation (WTO). In doing so, it will take sole responsibility for the control and governance of its external trade policy with all other WTO members (including the EU) within the framework of WTO rules. This paper explores the nature of those WTO commitments and how they might impact the UK from the date of its exit from the EU. Read Briefing Paper 1 – THE WORLD TRADE ORGANISATION: A SAFETY NET FOR A POST-BREXIT UK TRADE POLICY? Professor L Alan Winters, Lord O’Donnell and Amar Breckenridge discuss the future of UK trade policy in a Trade Knowledge Exchange Webinar, recorded on 20 July 2018. Listen to the full recording of the session. Read a digest of the webinar in ‘Five things to know about UK Trade Policy after the White Paper‘. In addition to our Briefing Paper and blog series, the Observatory also produces various other written materials as categorised below.